14 Book Set. A treasury of stories for young children which will motivate them to develop cognitive skills and key literacy concepts aligned to state academic standards. 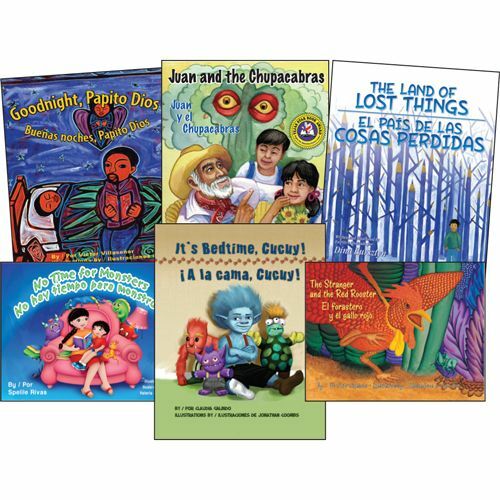 Students will enjoy the stories that are exciting and fun engaging them in the reading process. Hardcover. 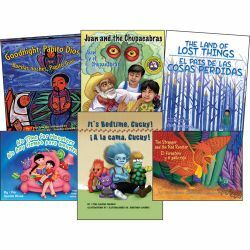 Titles include: Frog and His Friends Save Humanity/La rana y sus amigos salvan a la humanidad, Goodnight, Papito Dios/Buenas noches, Papito Dios, I Kick the Ball/Pateo el balón, It's Bedtime, Cucuy/A la cama, Cucuy, Juan and the Chupacabras/Juan y el Chupacabras, Kikiriki/Quiquiriqui, Little Crow to the Rescue/El cuervito al rescate, Mayte and the Bogeyman/Mayte y el Cuco, Mother Fox and Mr. Coyote/Mamá Zorra y Don Coyote, No Time for Monsters/No hay tiempo para monstruos, Stranger and the Red Rooster/El forastero y el gallo rojo, The Land of Lost Things/El país de las cosas perdidas, The Rowdy, Rowdy Ranch/Allá en El Rancho Grande, Zulema and the Witch Owl/Zulema y la Bruja Lechuza.